Although I feel like I should have lost 10 pounds in the past two days, of course, that’s just a dream. I have *worked* though! I’ve decorated the majority of the library… photos to come later… of course, we want it to look very spiffy since our special guest, Craig Johnson, will be there for our Open House/Silent Auction. After 8-5 of library decoration, I stayed til past 9 on Wednesday night working on these. What a precious flock of love birds!!! They are fantastic!!! They are made from a design from the Lia Griffith website. 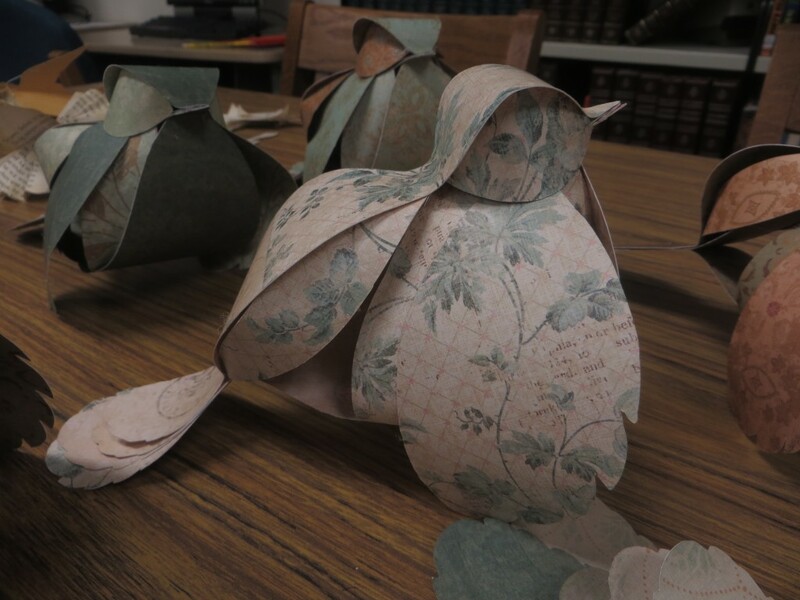 Seven pieces for each bird… each cut the same, but each bird ends up looking a bit different! They all have their own “personality”. Today, I spent gluing and wiring and spacing and looking and looking again… to create this. 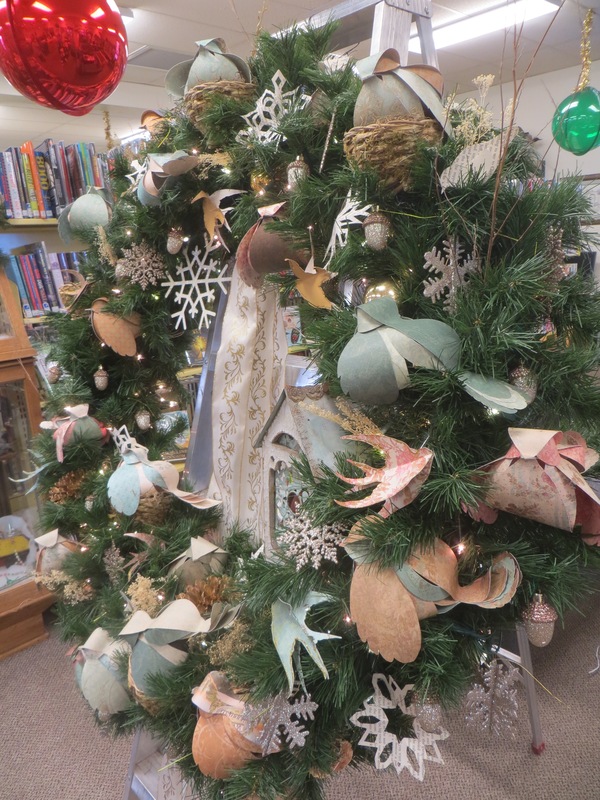 This is the Friends of the Ten Sleep Library’s entry for Worland’s Festival of Trees. “Snow Birds”. Here’s a closeup look at the front to an old birdhouse… with the bird “inside” on its nest. A touch of “whimsy” as a co-worker said! This wreath has paper love birds, swallows, book birds, glass balls, nests, snowflakes, 3D snowflakes, pinecones, book snowflakes, baby’s breath, sticks, and glittering acorns in abundance! It is up for auction Friday evening at the Worland Community Center. 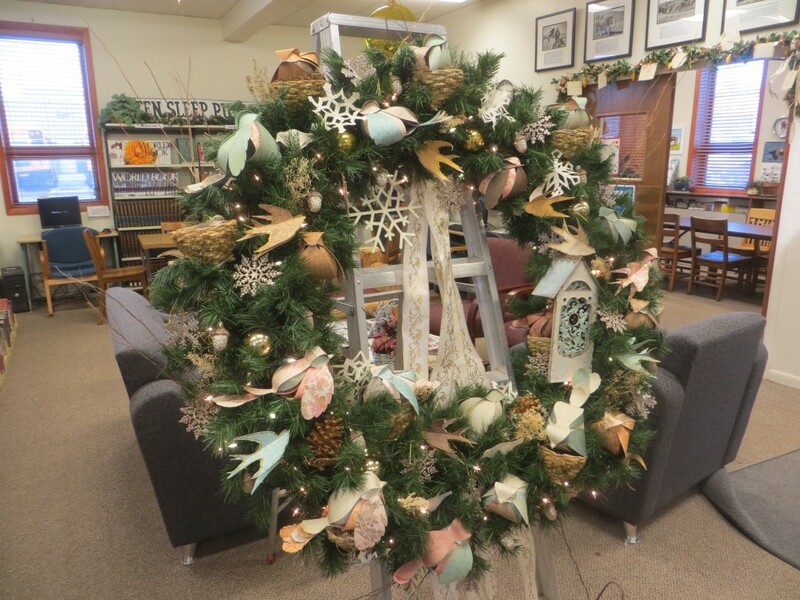 If you can attend, please do… and please bid on the “Snow Birds” wreath! I love it! and hey, while you’re at it, please TWEET, reTWEET, and share! I love the old birdhouse in the wreath. 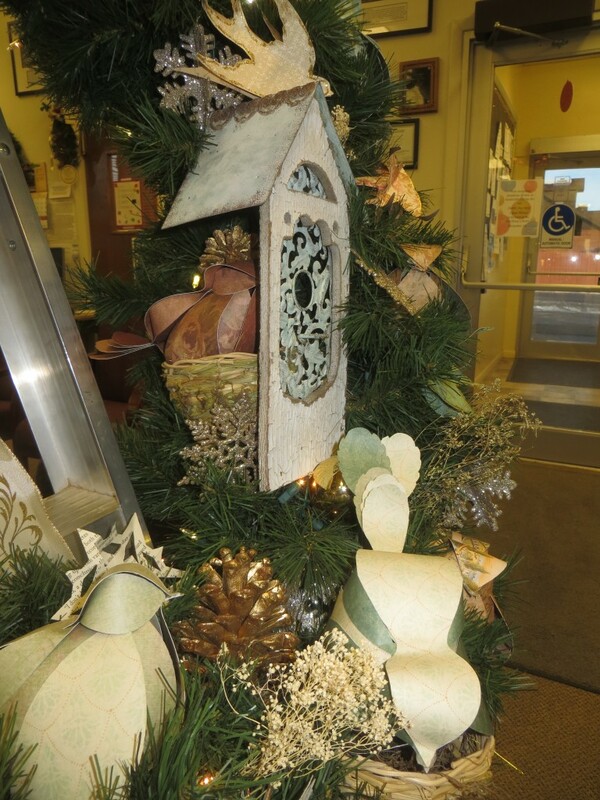 Birds + wreath = SPECTACULAR! gorgeous. Looks like it will be a gathering place for some admiring visitors at the library, and then in someone’s home. Gorgeous!!! Snow Birds – What a unique lovely display. You are so talented. Love those birds and that wreath is art! Your talents once again come shining through! Those birds are so lovely! The whole wreath is gorgeous and so classy! Love these birds. Wallpaper, right? Love the wreath! I hope it brings much $$ at the silent auction. Can’t wait to see pictures of the Library when it’s fully decked out for Christmas. Great work Carol. The wreath looks WONDERFUL. 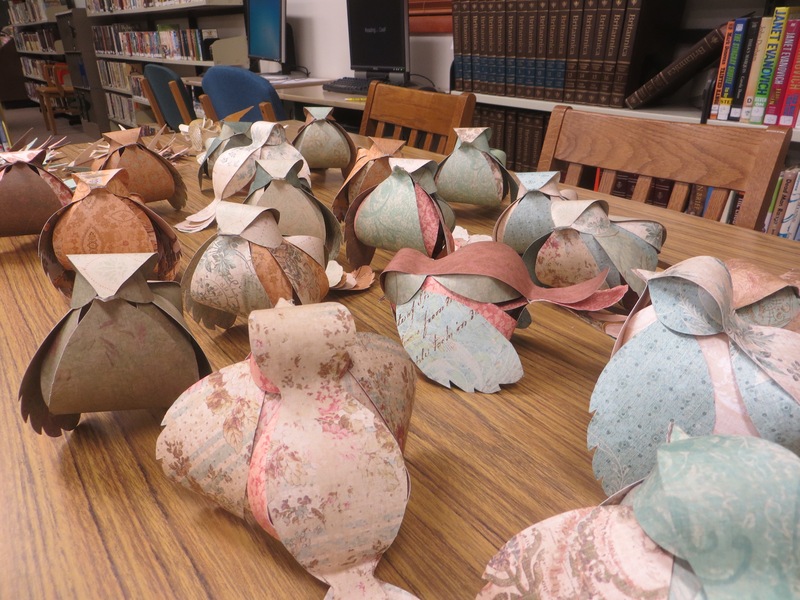 Looking forward to more photos of your Library in its Christmas glory.